The planetarium documentary “The Hot and Energetic Universe” presents with the use of Immersive Visualisations and real images the achievements of the modern astronomy, the most advanced terrestrial and orbital observatories, the basic principles electromagnetic radiation and the natural phenomena related to the High Energy Astrophysics. High Energy Astrophysics plays a key role in understanding the universe. These radiations reveal the processes in the hot and violent universe. High Energy Astrophysics probes hot gas in clusters of galaxies, which are the most massive objects in the universe. It also probes hot gas accreting around supermassive black holes in the centers of galaxies. Finally, high energy radiation provides important information about our own galaxy, neutron stars, supernova remnants and stars like our Sun which emit copious amounts of high energy radiation. Europe plays a leading role in high energy astrophysics research. The XMM-Newton and the Integral missions, are leading the exploration of the X-ray and gamma-ray universe. ESA‘s mission ATHENA, to be launched in 2028, will carry the most sensitive X-ray telescope ever and it will be the flagship of all high X-ray missions. 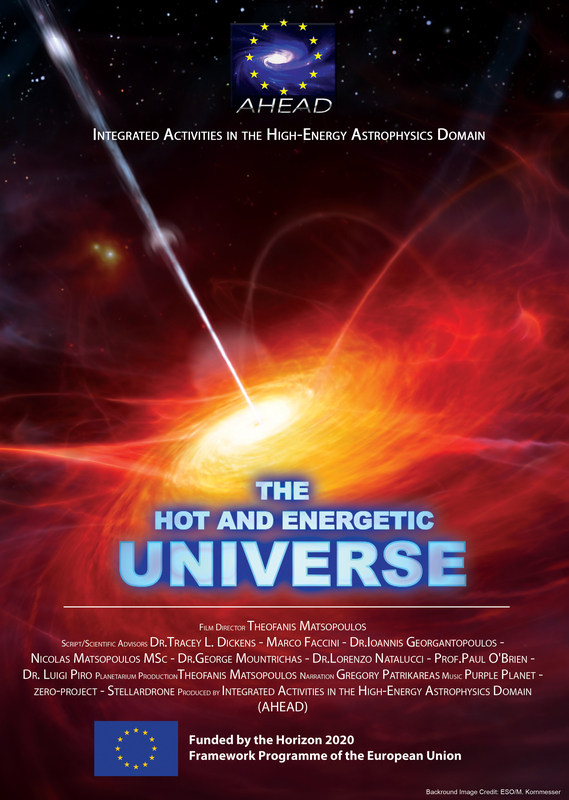 The producer of the documentary is the “Integrated Activities in the High-Energy Astrophysics Domain” (AHEAD). AHEAD is a project funded by the European Commission in the framework of Horizon2020 (Access to large scale facilities). It is led by IAPS/INAF in Rome and involves most Universities and Research institutes which are involved in High Energy Astrophysics in Europe. The project aims to combine the efforts of all these Institutes in the analysis of X-ray data and facilitate the access to infrastructures distributed across Europe. Special Thanks: European Space Agency (ESA), National Aeronautics and Space Administration (NASA), European Southern Observatory (ESO), NASA Scientific Visualization Studio, Hubble Space Telescope (ESA-Hubble), Italian Space Agency (ASI), Thales Alenia Space Italia, Jet Propulsion Laboratory (JPL), National Institute for Astrophysics (INAF), University of Leicester, National Observatory of Athens (NOA). Recording: Urban Life Studio Inc.
Cooperation: Tajima Hideki Office Ltd.